One of the reasons we do a lot of light table activities in our house is that it is so versatile. Translucent or not, many items look more appealing on the light table. 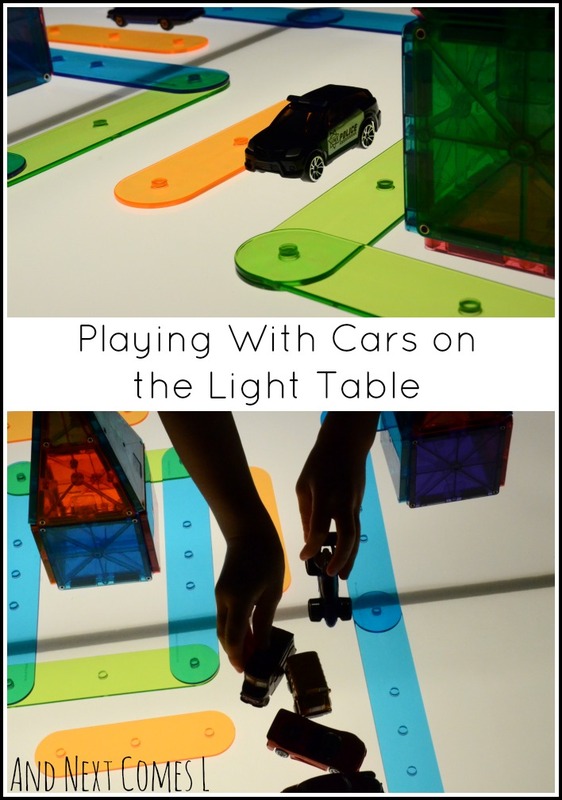 This particular car themed light table activity for kids combines translucent objects with non-translucent objects on the light table to encourage creativity and imaginative play. While playing with our latest new toys, Learning Resources Letter Construction Set, I noticed that the pieces would be a neat way to make roads on our DIY light table. So together J and I set up a translucent city complete with translucent roadways. We used our super awesome Magna-Tiles to make the houses in our city. Then we grabbed some cars. Okay, I'll be honest, J may have grabbed a lot of cars. Then it was time to play! J enjoyed driving the cars around the town, but eventually had them all park (or perhaps crash?) in one small corner of town. However, I soon found out that all those cars were parked in front of this house for a party. J started using his pointer finger as an imaginary person from each of the cars. He even walked his pointer finger from the cars to the house. J also scoffed at me for offering some of our Safari Ltd. people to use in the town. He much preferred his "finger people." Omgoodness this is SOOO cool!! My little guy would have a blast with this. How creative! This letters construction set looks great! And you are amazing in finding creative ways to use toys - your light table activities are fantastic! Thanks, Anik! What until you see what else we did with the letter construction set! This is so creative! I had to find out what you were using for the roads and I can't believe it's a letter construction set. Great idea! Hahaha...yes, we're unpredictable with things like that. Especially on the light table!